The Oh Really » Get Their Heads Together. Kiss My Tag. | Home | My Bologna. 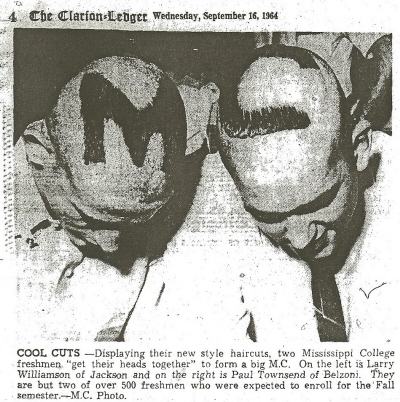 My dad told me once that when he was a freshman at Mississippi State, some upperclassmen shaved his head into a checkerboard pattern. I thought that was so cool, the essence of college life, and then I went to college one day and no one did anything remotely like that and I thought either he or I made the whole thing up. Then I was looking for something on a reel of microfilm — because that’s the way I roll — and I found this from 1964, which is the year after my dad started college. Maybe he was telling the truth after all! Maybe rampant patterned head-shavery swept the state! Questions: Would you rather be M or C? Do you think they argued about it? This entry was posted on Thursday, October 19th, 2006 at 2:38 pm and is filed under Uncategorized. You can follow any responses to this entry through the RSS 2.0 feed. Both comments and pings are currently closed. i remember in college these two guys got drunk and shaved each others’ heads. but that was cause they had both caught crabs. apparently that happened simultaneously as well. Oh, Herman. Where do you come up with this stuff? It’s brilliant! Its true, and…and…I don’t want to talk about it. Okay, it wasn’t me, but that is a great legendary Milsapian college story.